Until the 1940s, when the use of chemical herbicides first became widespread, physical, cultural and biological weed management were the only means of controlling weeds. The ability of the selective and systemic herbicides to kill weeds but leave crops unharmed or to kill even large plants, even those that could regenerate from underground structures, appeared almost magic to the farmers of the time. These astounding abilities lead to a widespread belief that herbicides would solve the ‘problem’ of weeds once and for ever. However, after over 50 years of widespread herbicide use it is clear that the ‘war on weeds’ is far from over, and that if anything, sole reliance on herbicides is a loosing strategy. Herbicide resistant weeds are an increasing problem and the negative side effects of herbicides are a growing concern. This has seen a resurgence of interest in the ‘old guard’ of physical, cultural and biological weed management, which, combined with the judicious use of herbicides and based on a thorough understanding based in weed science is called Integrated Weed Management or IWM. 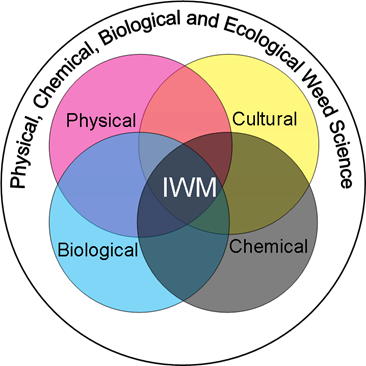 The four complementary aspects of Integrated Weed Management (IWM) built on the solid foundation of weed science. The common conception of physical weeding is hoeing weeds from a crop. However, from an IWM perspective hoeing is just the ‘icing on the cake’ or if things are going badly ‘the ambulance at the bottom of the cliff’ (remembering physical weeding is just one part of an integrated weed management system). Relying on in-crop weeding as the sole or even main means of weed management is likely to result in weed management becoming impossible after just a few years. Based on scientific research and our own extensive practical experience PhysicalWeeding believes that one of the most important aspects of physical weed management in annual crops, especially vegetable and similar lower competitive crops, are false and stale seedbeds. These are not new ideas, and were widely practiced before the advent of herbicides, but during the last fifty years they have slipped from living memory. These terms are also often used interchangeably, however, here they are considered to be two distinct but related approaches. 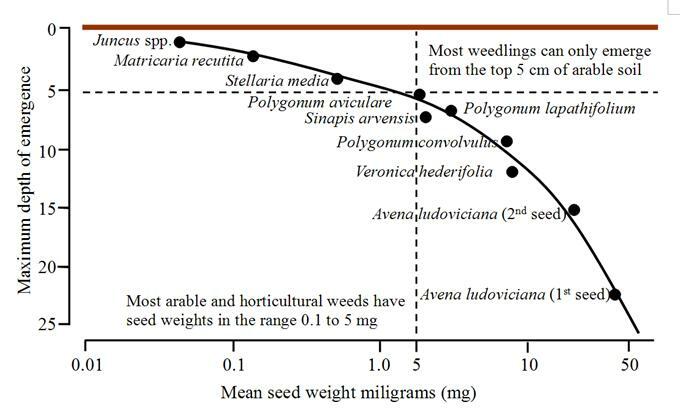 The vast majority of weeds only emerge from seeds in the top 5cm / 2” of soil, and most typically only emerge in significant numbers from the top 2.5cm / 1” of the soil. This knowledge can be used to eliminate many, if not most, of the weeds that would normally infest an annual crop at establishment. This is done by creating a planting tilth but then delaying planting so that the weeds germinate and/or emerge before the crop and are then killed either by further tillage, thermal weeding or herbicides. The former is called a false seedbed, as the original seedbed is not the true final seedbed, i.e., it’s a false seedbed and the latter a stale seedbed as the first seedbed has aged, or become ‘stale’, by the time the crop is planted and/or emerged. The two diagrams below show the details of how false and stale seedbeds work. False seed bed: A seedbed is prepared, weed seeds in the top 5 cm / 2” of soil germinate and then emerge, the soil is then re-tilled (cultivated) with the minimum disturbance necessary to kill weed seedlings, the crop is then sown, germinates and emerges from mostly weed free soil. Stale seed bed: Final seedbed is prepared, weed seeds in the top 5 cm / 2” of soil germinate, crop is sown, weed seedlings emerge, immediately prior to crop emergence weed seedlings are killed by a thermal weeder, crop emerges from weed free soil. Each of these techniques has a component that is critical for its success. For false seedbeds re-tillage must involve the minimum depth of tillage necessary to kill all weedlings, and must be less than 5cm / 2” otherwise non-dormant weed seeds could be brought up from lower soil levels which then germinate in the crop. For stale seedbeds the thermal weeder should be used as close to crop emergence as possible to get the greatest benefit which means it needs to be both fast and effective as the time-window for successful treatment can be very short, e.g., hours. However, until now there were no tillage machines on the market that were specifically designed to achieve optimum false seed retillage, and many existing thermal weeders are too inefficient, in terms of work rates and/or fuel consumption. PhysicalWeeding is your one-stop solution for optimal false seedbed tillers, flame weeders and steam weeders.